A new channel has started in DVB-S Clear: Life TV (United Kingdom) on 12562.00MHz, pol.H SR:27500 FEC:3/4 SID:6 PID:774/1030. A new channel has started in DVB-S2 Clear: Life TV (United Kingdom) on 12303.00MHz, pol.V SR:27500 FEC:2/3 SID:802 PID:8002/8102 Russian. A new channel has started in DVB-S2 Clear: Life TV (United Kingdom) on 3854.00MHz, pol.R SR:9664 FEC:3/4 SID:162 PID:1162[H.265]/2162. 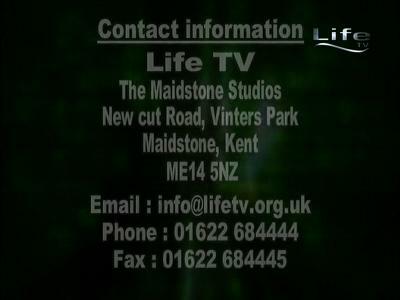 A new channel has started in DVB-S2 Clear: Life TV (United Kingdom) on 11977.00MHz, pol.H SR:27500 FEC:8/9 SID:600 PID:423[MPEG-4]/335. Life TV has left 12685.00MHz, pol.H (DVB-S SID:1440 PID:1441[MPEG-4]/1442), it is no longer transmitted by satellite in Europe. A new channel has started in DVB-S Clear: Life TV (United Kingdom) on 12685.00MHz, pol.H SR:27500 FEC:5/6 SID:1440 PID:1441/1442. A new channel has started in DVB-S Clear: Life TV (United Kingdom) on 11386.00MHz, pol.H SR:27500 FEC:3/4 SID:14 PID:2014/3014. Sky Digital: Life TV has left 11546.00MHz, pol.H (DVB-S SID:50435 PID:2312/2350 English), it is no longer transmitted by satellite in Europe. Sky Digital: New frequency for Life TV: 11527.00MHz, pol.V (DVB-S SR:27500 FEC:2/3 SID:50330 PID:2344/2345 English- Clear). Sky Digital: New PID for Life TV: PID:2342/2343 English SID:52119 (11259.00MHz, pol.V SR:27500 FEC:2/3 - Clear). Sky Digital: A new channel has started in DVB-S Clear: Life TV (United Kingdom) on 11259.00MHz, pol.V SR:27500 FEC:2/3 SID:52119 PID:2322/2327 English. Sky Digital: Life TV has left 12524.00MHz, pol.V (DVB-S SID:9542 PID:2316/2317 English), it is no longer transmitted by satellite in Europe. Sky Digital: New PID for Life TV: PID:2316/2317 English SID:9542 (12524.00MHz, pol.V SR:27500 FEC:2/3 - Clear). Sky Digital: New PID for Life TV: PID:2316/2317 English SID:9542 (12402.00MHz, pol.V SR:27500 FEC:2/3 - Clear). Sky Digital: New frequency for Life TV: 12524.00MHz, pol.V (DVB-S SR:27500 FEC:2/3 SID:9542 PID:2310/2311 English- Clear). Sky Digital: New PID for Life TV: PID:2310/2311 English SID:9542 (12402.00MHz, pol.V SR:27500 FEC:2/3 - Clear). Sky Digital: New frequency for Life TV: 12402.00MHz, pol.V (DVB-S SR:27500 FEC:2/3 SID:9542 PID:2305/2306 English- Clear). Sky Digital: Life TV has left 11681.00MHz, pol.V (DVB-S SID:51108 PID:2323/2324 English), it is no longer transmitted by satellite in Europe. Sky Digital: New PID for Life TV: PID:2323/2324 English SID:51108 (11681.00MHz, pol.V SR:27500 FEC:2/3 - Clear). Sky Digital: New PID for Life TV: PID:2322/2323 English SID:51108 (11681.00MHz, pol.V SR:27500 FEC:2/3 - Clear). Sky Digital: New frequency for Life TV: 11681.00MHz, pol.V (DVB-S SR:27500 FEC:2/3 SID:51108 PID:2324/2325- Clear). Sky Digital: Life TV (United Kingdom) broadcasts in DVB-S Clear on 12344.00MHz, pol.H SR:27500 FEC:2/3 SID:8662 PID:2353/2354. Sky Digital: New PID for Life TV: PID:2344/2345 SID:8652 (12344.00MHz, pol.H SR:27500 FEC:2/3 - Clear).